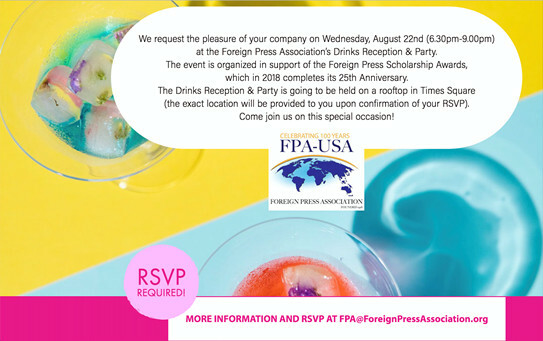 The Foreign Press Association invites OPC members for a reception and party to support the group’s Foreign Press Scholarship Awards. 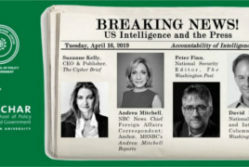 The event will be held on a rooftop in Times Square. The exact location will be provided upon confirmation of your RSVP. 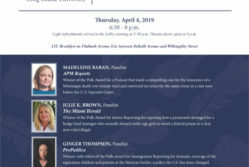 The cost is a $10 minimum donation that goes in support of Foreign Press Scholarship Awards for international journalists who take their master’s degrees in Journalism Schools in the U.S.
For information and to RSVP email FPA@ForeignPressAssociation.org.